A new vocal series is something to get excited about! We enjoyed Vira & Friends Sing the Classics so much that we have already put the next recital on our calendar and so should you; it will be at 5:30 on September 15th at the same location--Scorca Hall of the National Opera Center. Two things impressed us right away in addition to the singing. Firstly, the programming was given over almost totally to story telling. Each singer performed at least one cycle each of which was like a mini-opera. The second thing that impressed us was hearing an excellent collaborative pianist whom we'd never heard before. 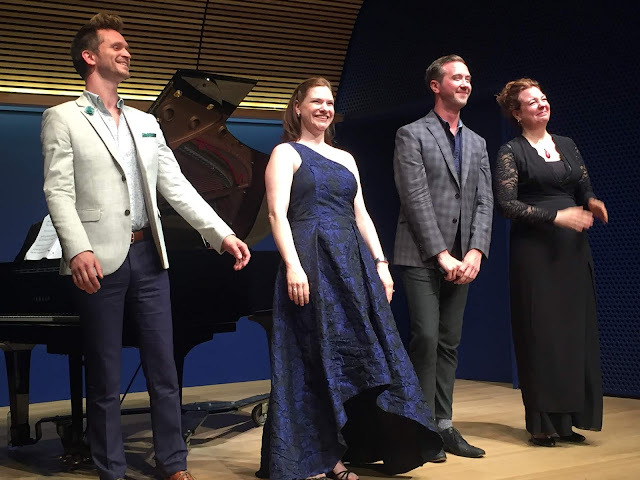 David Sytkowski doesn't play much in New York so we consider ourselves fortunate to have heard him, bringing out so many subtleties of the accompaniment whilst supporting the singers with sensitivity and generosity. We appreciate the lid being on the long stick for maximum tone. Soprano Vira Slywotzky-- whom we have reviewed so many times with 5BMF, Mirror Visions Ensemble, Light Opera of New York, and Victor Herbert Renaissance Project Live--welcomed the audience and got things started with a trio of songs by Stefano Donaudy from Arie di Stile Antico. Donaudy was a contemporary of Giacomo Puccini who looked forward in time and moved opera into the 20th c. whilst Donaudy often looked back into the Baroque. Ms. Slywotzky has a lively and inimitable personality that serves her well in song interpretation. There were no titles or translations but the singers introduced the songs of their choice and told the audience what the song was about--a reasonable alternative. "Sorge il sol! Che fai tu?" was performed with appropriate gaiety. "Sento nel core" was filled with Baroque sensibility and a pleasing excitement. In "Vorrei poterti odiare", Mr. Sytkowski's frisky piano and Ms. Slywotzky's exaggeratedly rolled "r"s limned the ambivalence of the song's text. In Debussy's Trois Chansons de Bilitis, we heard a somewhat different interpretation than we heard the last time. That is what is so great about art, that it can be interpreted in many ways. The last time we heard this cycle, the woman was giving us snapshots of three stages of her life with the third song interpreted as one of a late stage breaking-up love affair with all the magic gone. Ms. Slywotzky's interpretation was far more sanguine with the man showing the woman what she was longing for through a shard of ice. Her final selection was Schubert's setting of von Collin's horrific "Der Zwerg", the story of which we have always detested. But she told the tale well, in spite of being "on the book". Her dramatic abilities are keen and just a touch more differentiation of color among the narrator, the young Queen, and the murderous dwarf would have pushed the performance into a higher level. We kept thinking of the four voices necessary for Schubert's "Erlkonig". We hope she will perform the song again without the music stand. We had only heard mezzo-soprano Elizabeth Pojanowski once before in Greg Kallor's The Tell-tale Heart. It is difficult for us to evaluate a singer's vocal artistry in contemporary works, especially sung in English. We only recall her theatrical flair. But listening to her singing Rossini's late-life cycle La Regata Veneziana enabled us to appreciate her voice as well as her dramatic skills. We got to hear Anzoleta's anticipation of her lover's competition in the regatta, her wild excitement during it, and her pride and satisfaction in Momolo's winning. All this in Venetian dialect! It was a splendid performance of an old favorite of ours and of mezzo-sopranos everywhere. Where would mezzos be without Rossini! We were slightly less enthusiastic about her performance of five excerpts from Robert Schumann's Frauenliebe und -Leben. For one thing, we missed our favorite songs. For another, we were distracted by the singer's inconsistency with the "ch" sound. At times it was correctly pronounced; at other times it was almost omitted, and occasionally it was too 'hard'. This flaw is so common in American singers but it shouldn't be! There are always some of us in the audience who are German speakers and who will notice the lapse. We understand that this cycle has personal meaning for Ms. Pojanowski who has lived through courtship, marriage, and motherhood and we wanted so much to be drawn in but the German got in our way. We also like to hear more change in color from the starstruck adolescent in "Seit ich ihn gesehen" to the mother in "An meinem Herzen". Perhaps if the singer had performed the entire cycle straight through to widowhood we might have heard this evolution. The third singer on the program was mellow-voiced baritone Samuel Schultz, heretofore unknown to us. We have heard Ravel's cycle Don Quichotte à Dulcinée several times this year and love the opportunity it gives the baritone to show three separate emotions. He is the ardent lover, then the virtuous devoté of the saints, and finally, the bibulous knight in his cups. Show us a singer who doesn't love to play drunk or an actor who doesn't love a good death scene! We found Mr. Schultz' French adequate, as we did Ms. Slywotzky's in the Debussy, but our native French-speaking companion thought somewhat less of their linguistic skills. Speaking of which, Mr. Schultz' English was totally comprehensible in the final set of songs--and that's rare. What we heard did nothing to improve our opinion of contemporary composers' ability to write for the voice. We believe that their choice of text is largely at fault. Erich Korngold's setting of Margaret Kennedy's "Tomorrow" was just gloomy. These two icons of the 20th c. were contemporaries. Although Mr. Schultz gave clarity to each word, we found our mind wandering. In Everyone Sang, a song cycle by the living composer David Conte, we were happy to focus on Mr. Sytkowski's performance of Mr. Conte's lovely writing for the piano, but the vocal line and the text struck us as typically uninspiring, in spite of the fact that the singer was coached by the composer. Perhaps 19th c. composers just knew how to select text that would "sing". Let it be noted however that the sizable audience applauded mightily and seemed not to share our indifference. Vira & Friends merits financial support and if you are a fan of art song recitals, you might want to see the website for updates. www.viraslywotzky.com/engagements. Or email to info@viraslywotzky.com.